Description: Black Genuine leather, soft, mouldproof, breathe freely and absorb sweat Universal to fit 37 to 38cm diameter steering wheels (If it's wider to fit, could be cut down a partial) Built to strict quality control standard. Specification: Steering Wheel Cover Material: Genuine Leather Fit for Steering Wheel Diameter Size: 37 - 38cm / 14.5" - 14.96" Steering Wheel Cover Colour: Black with Red Cross Stitching Package Included: 1X Steering wheel cover. 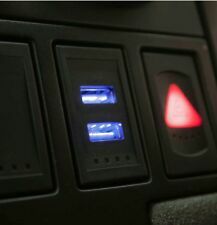 VW OEM style USBs charging point to match existing blanking insert. Complete unit, OEM style Face and USB together . Tighten the small screw. the gear head directly set into the shift knob rod. Remove the original car gear shift knob. Put The gear head into the shift knob. take Plastic adapters suitable size For shift knob. 1 X Ignition Starter Switch. IP67 rated waterproof, anti-dust, great for outdoor use. Compatible With: Fit for all car. Easy installation. Information about. Car Blue Steering Wheel Quick Release HUB Racing Adapter Snap Off Boss Kit UK. CAR QUICK RELEASE SNAP OFF STEERING WHEEL HUB RACING BOSS KIT FOR MOMO OMP UK. Universal Car Steering Wheel Quick Release HUB Racing Adapter Snap Off Boss Kit. CITROEN BERLINGO III 2009 - 2011. BLACK LEATHER GEAR GAITER SHIFT BOOT. This leather gaiter will improve the appearance making, your gear shift look like new again. This is the standard doorbell switch. Switch type: Vandal Resistant. Stable Positions number: 1. Description: Features: - High Quality materials, non-slip, breathable, reinforced grasp handle. - Precision sewing, fine workmanship. Simple installation, easy disassembly. 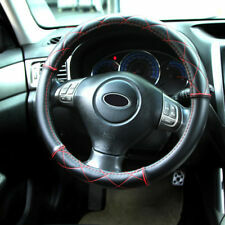 - Can protect the steering wheel, decorate your car, highlighting the more fashionable. - Wearable and practical, is the best choice for motorists. 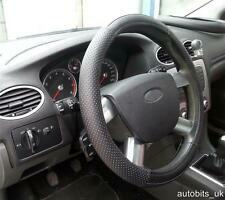 - Best steering wheel cover for all seasons. Blank Button Stickers for VW Mk5 Mk6 Golf vehicles and maybe more. Original stickers, fromAesthetic Creations, USA. These novelty stickers are designed to be used on the empty buttons next to the ESP switch, just behind the gear stick. Perfectly sizedblack plastic inserts to disguise the unsightly handle screws. Fits all mini variants from 2001 to 2006. Set of 6 which is enough for both doors. Takes just minutes to fit, no tools required. VW BEETLE 1998-2005. Easy to install, remove (twist, unscrew) your old gear knob. 1 × 5 Speed Gear Shift Knob with Boot. ☆ Color: Grey seat and black gear knob. ☆ Gear Stick Hole Size:12mm. ☆5 gear (1, 2, 3, 4, 5 ) and Reverse. Easy Quick Fit - Front Pair - Tear Proof, Anti Stain, Washable, Pet, Dog Friendly, Wipe down with a Damp Clothe, Protective seat protection against stains. Toyota:Auris,Avensis,Previa,Prius,Verso,Yaris,Aygo. Fits Citroen Relay, Fiat Ducato And Peugeot Boxer From 1994 To 2006. (Peugeot Boxer Citroen Relay Fiat Ducato Outer Sill Repair Panel)'s compatibility is a guide only. Fiat Ducato Peugeot Boxer Citroen Relay Hazard Warning Switch 230. Material:3D carbon fiber(NOT real carbon fiber ). Seriously promise front door:60 6.8cm & rear doorD 40 6.8cm. Applicable Car:Universal（Can be cut）. (E.g. you brought wrong model or wrong color). Audi Tt Mk1 Air Vent Gauge Mount Adapter Ring only. boost gauge is shown for pictures only. will need to be glued /bonded into the back of the vent. Height: 85mm. - This Universal Car Manual Gear Shift Lever Knob is with chic and individualized design. 1 X shift knob. Mount Hole Diamater: 17.5mm. Color: Black. - A perfect decoration for your car. What you will get just is a cap, gear stick knob is not included. 1 x Gear Stick Knob Cap. Colour: Glossy Black. - Easy to install. Material: ABS plastic. Detail Image. Material: soft jelly. Battery: 1 X AA (Not Included). Length: 25.0 cm. CHANGE LEVER WITH RETAINER GAITER. Head Bolts. Fuel Rails. Fuel Rail Sensors. Main Bearings. Big End Bearings. ADD TO FAVOURITES. Flash Relays. They are not suitable for curving around a stepped sill. Attractive ribbed pattern runs the length of the protector which is ideal for trapping dirt and easily brushed out. Ready attached double-sided tape makes fitting a breeze. Fits: Vauxhall Corsa D (2006-2014). This chiswick steering wheel cover adds comfort and grip to your existing steering wheel. Tailored to the Corsa steering wheel, it's made from a stylish and soft leather look material. 2 PCS Carbon Fibre Effect Racing Style Seat Belt Shoulder Pads - BASED ON THE OPTIONS YOU SELECT. Made with Carbon Fibre Effect material with embroidered car logo. Fits all standard seat belts and secured in place by a Velcro strip. Perfect for Competition Cars. 1 X Push Button. - Easy to fit. Color: like the picture show. We will try our best to reduce the risk of the custom duties. Battery: 2 X AA (Not Included). Length: 26.7 cm. Fiesta mk 7 heater vent Gauge pod Adapter. Simply remove the heater vent and mount these in place of the heater vent. Designed to mount 1 x 52mm gauge in the drivers vent. Customise your Vauxhall Astra. They are stickers made from vinyl which has a Black gloss base. This makes it difficult for adhesive to stick and you only need a tiny amount. It is important that you try and clean it off before you start.